This week’s parashah, Parashat Shemini, describes the dedication of the Mishkan (Tabernacle) with its Holy Ark. Similarly, its haftorah describes the ceremony of the return of the Holy Ark to the holy city of Yerushalayim, which was to come before the dedication of the Beit Hamikdash – the Holy Temple. In the Parashah, Moshe consecrates the Mishkan, the home of the Ark of the Covenant (Vayikra 9), while in the haftorah, King David sets out to bring the Ark to Jerusalem. (2 Shemuel 6:2-5). Both the parashah and its haftorah teach that coming too close to holiness without proper awe and respect can be detrimental. In the parashah, Nadav and Avihu where killed “when they drew near” to the Ark (Vayikra 16:1-2), while in the haftorah, Hashem killed Uzzah when he “put forth his hand to the Ark” (2 Shemuel 6:6-7). “The Israelites brought up the Ark with shouting and the sound of the horn, and David danced with all his might girded with a linen ephod” (2 Shemuel 6:14-15). How come David’s uncontrolled dance was not considered disrespectful to the Ark, in the same way that Uzzah “put forth his hand” and Nadav and Avihu “offered a strange fire” and were killed? 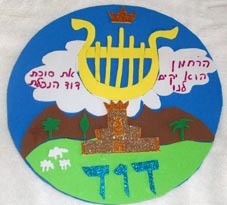 Perhaps the underlying connection between the parashah and the haftorah teaches us the boundary between going overboard in expressing one’s personal way of worship, and excessive restraint that turns off our personal, passionate worship of Hashem. When David danced in jubilation for the return of the ark, he taught us the proper place to express uttermost excitement for the Holiest of Holy. David knew how to dance on the dangerous tightrope between the dance of death and the truest life expression. Nadav and Avihu, however, made up their own way of worship, other than what was commanded by Hashem. Unbeknownst to themselves, they were motivated and led to their sorrowful death by their personal ego. Hashem wants us to express ourselves personally in our worship to Him, but only as long as we keep our humility intact. The more originality and creativity in our worship of Hashem, the more humility is required of us. David expressed his utter humility by changing his majestic clothing into an Ephod – the plain robe worn by a priest as he officiates in the Temple (2 Shemuel 6:14). The significance of King David changing out of his royal robes and into the spiritual dress reflects his taking off the pomp and distance of his office and re-finding inside himself that simple spiritual place of dance. As a king it would be beneath his dignity to twist and twirl before the Ark. Yet, “Man sees [what is] before [his] eyes, but G-d sees the heart” (1 Shemuel 16:7). The change of clothing was an expression of King David breaking through to his spiritual core – Hashem – the source of Eternal Life – the very opposite of the external “strange fire” with death in its wake. “As the Ark came into the city, Michal the daughter of Shaul looked out the window and saw David leaping and dancing, and she despised him in her heart” (2 Shemuel 6:16). Michal felt that David’s unrestrained dance was unbecoming a king like himself, and especially in front of the Holy Ark (Metzudat David, 2 Shemuel 6:16). Moreover, she was embarrassed that her husband, David, wasn’t properly dressed as befits a king when the entire people are present. She disdained David for his lack of self respect and for “uncovering himself before the eyes of his servants’ handmaids” (2 Shemuel 6:20). Michal scolded David for acting as a commoner and lowering his dignity. “Michal the daughter of Shaul came out to meet David, and said, how glorious was the king of Israel today, in that he uncovered himself today in the eyes of the handmaids of his servants, as one of the low fellows shamelessly uncovers himself?” (2 Shmuel 6:20). Michal was called, “the daughter of Shaul,” when she scorned King David for exposing himself. Her attitude reflected that of the daughter of a king. As an aristocratic princess, she was appalled by David’s undignified behavior. Michal’s father, Shaul, was moreover, known for being especially dignified. He was “a choice young man, and handsome; and there was not among the children of Israel a goodlier person than he: from his shoulder and upwards he was taller than any of the people” (1 Shemuel 9:2). Michal took after her father. Just as Shaul was taller and lifted above the people, so too was Michal aloof and preferred her husband not to lower himself to the level of regular people. In contrast, David’s greatness is that he remained one of the people. He was born a simple sheepherder, and in spite of his success and royalty, he remained in his own eyes as one of the simple people. David retorted to Michal that he danced before G-d who “chose me over you father… Therefore will I play before Hashem, and I will yet be more lightly esteemed than this, holding myself lowly…” (2 Shemuel 6:21-22). “And Michal, the daughter of Shaul, had no child to the day of her death” (2 Shemuel 6:23). What is the underlying connection between Michael’s disdain for David’s dance and her childlessness? Perhaps because she was unable to lower herself towards the common people, she would also be too self-important to lower herself to the “inferior human beings” that children are. Moreover, children learn by example, especially by the example of the expression of their parents’ emotions. Rabbi Moshe Weinberg taught that a major reason why children go off the derech (leave the Torah way) is because they see their parents bored when the Rabbi speaks, or during prayer, yet their Daddy jumps up and down in excitement in front of a football game. It is not our words but rather the intensity of our emotions which shape our children. Our sincere passion for Torah and mitzvot has a much deeper effect on our children than the most well-thought out pep-talk. Since Michal didn’t allow David to express his immense happiness for the Holy Ark, which served as a prime example of love of G-d to his children, Michal was not worthy of having her own children. Dancing in holiness, especially, is a way to connect with children. As we hold the child’s hand we are reconnecting to our own inner child that just wants to jump, move, skip, hop, and sing praise to Hashem for His miracles. In order to master any character-trait, we need to know its proper boundary, by being willing to apply its opposite when needed for the sake of Hashem. Avraham’s love of G-d became revealed only when he demonstrated his fear of G-d through his willingness to sacrifice his favorite son for the sake of obeying Hashem. Rav Tzadok Hakohen explains that there is rectified and un-rectified tzniut. Michal, daughter of Shaul, despised David for revealing himself in a way that looked the opposite of the tzniut she had learned in her father's house. Yet, she did not understand that David acted for the sake of Heaven, and Michal was punished with childlessness for trying to use tzniut against the honor of Heaven. Her tzniut was the external tzniut of the gentiles. Achasverus became angry when Esther entered [and offered herself willingly to him] as he thought that this is not the way of tzniut (Yalkut Esther 1056). He did not recognize that Esther came before him dressed in Ruach Hakodesh and intended for the sake of Heaven. True tzniut can only be manifested when we apply its limitation for the sake of Hashem. Kings and prophets descended from Tamar because of her tzniut (Megillah 10b). Yet, her tzniut tzniut was only revealed when she dressed up as a harlot on the highway to seduce Yehuda for the sake of Heaven (Rav Tzaddok of Lublin, Divrei Sofrim, Likutei Amerim, sign 16). We have to be careful with this kind of Torah, as it could be misused to exonerate immodest behavior. Moreover, it is not so simple to determine which kinds of actions for the sake of Heaven supersede the boundary of accepted tzniut behavior. Evidently, we do not have license to break clear-cut halacha even “for the sake of Heaven”. Only in instances where the halacha is unclear, does the spirit and the intention play an important role in deciding how to act. I’d like to call on the reader to discuss this issue. What are the boundaries of tzniut? Is it possible to be overly modest? In which cases does modesty yield for the sake of Heaven? As I wrote in Outside/Inside, Sarah Schneirer is quoted, shortly before her death, as having said that a Jewish woman should keep two notes, one in each pocket. One should read "kol kevudah bat melech penimah," and the other should read "et la'asot laShem." Being an activist, public speaker, or whatever doesn't contradict tzniut as long as the focus is leshem Shamayim. Along these lines, I once heard a rabbi, after his speech, request that the women write down their questions and pass them forward rather than raise their hands to ask them, since he said it's assur for women to speak in public(!). I asked Rav Yitzchak Berkovits about this, since he knows I speak for mixed (and even all-male) audiences. "Am I operating on some ba'alat teshuvah heter?" I wanted to know. "Absolutely not," he said. "I completely disagree with that rabbi's interpretation of the halachah. If you get up there and do a song and a dance for the audience [he meant figuratively--i.e. put on a show], that's not tzanua and wrong. But if you give over your ideas with dignity, there's no contradiction to tzniut." What I hear from this is that if the focus is on the "form" (i.e. the external) rather than the content (i.e. the internal), it's a breach of tzniut. But the other way around, it's not, and can even be a mitzvah (which is what I would like to think my talks are!). I thought alot about your recent request that we discuss the boundaries of tzniut, and whether it is possible to be overly modest. I live in Ramat Bet Shemesh, and I recently started riding my amazing mountain bike, a sport popular amongst frum women in Los Angeles. Many friends commented that it is not tzniut (modest) to ride, and, as well, the pant/skirt ensemble I wear is too, "In your face". My response was that I am very careful with my tzniut- you will never see my calves, or bare legs, EVER! You will never see too much of my neck or arms, and my hair is always fully covered. I avoid overly fitted clothes, and do not wear slits in my skirts unless there is another full length skirt underneath. I ride, for the most part, on the outskirts of the community so as not to ruffle too many feathers. I think fitness is important, and riding out of doors gives me the opportunity to take in the breath-taking views and do my Hitbodedut (personal Tefillah to Hashem) in a free spirited , breeze on my face, natural environment (most conducive to connecting in). I see people staring at me. I wonder, "Do these women also wish to be free, and to be fit..? "...Do they lack courage? Are they overly bogged down in chumras (additional stringencies)? I do not know the answer, but I know that I fell such joy and inner satisfaction, so healthy, and so close to Hashem when I am on my bike...like King David must have felt dancing around the Aron...B'simcha v B'Ahava. I enjoy your beautiful words of Torah. misunderstood these mitzvot, had no knowledge about mutual, respectful physical intimacy and sensuality in marriage.... the beauty of mikva was lost to many, in the name of tzniut. I have a close relationship with Rebbetzin Rivky Slonim, who compiled Total Immersion - a compilation of mikvah stories and info. She always felt that people were so busy being tzanuah about this topic, that as a result women didn't know anything about it.